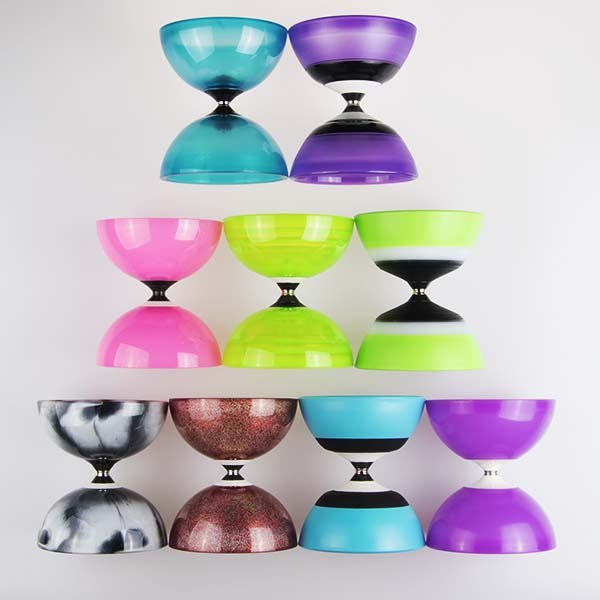 New technology and design has been lead by Sundis, working with diabolo designer Ryo Yabe. Sundia diabolos have pushed the design envelope over the last 5 years. In the past, diabolos were only made with a fixed axle and designed by toy companies with limited knowledge. Modern diabolos are made with a bearing axle that is fixed in one direction but can spin in the other direction, which has made many new tricks (e.g., x-caliber) possible. Many advanced tricks are only possible using a bearing-equipped diabolo. Sundia was leader in this development, though other brands have replicated their designs. For beginners, a fixed axel is still the easiest to start with. When you become proficient with a fixed-axle diabolo, you can move on to a bearing diabolo. Diabolo hand-sticks have also seen a lot of improvements. The balance and weight of sticks are very important when doing advanced tricks. Most good-quality sticks are now short and made of carbon fiber. The string for a diabolo is specific to the kinds of trick you intend to do. The string, like on a yo-yo, needs to be changed often to continue obtaining high-performance results. Tiabolo diabolos made in Taiwan, come in three models: Glary, lightweight and Super V2. Sundia offers many kinds of diabolos with both fixed or bearing axles. Comet teaching diabolos by Play Juggling are sold by the dozen for kindergarten- through 6th-grade students. Fire diabolos have a wick in the center and Kevlar string that does not burn. Diabolo hand sticks are made from carbon fiber, metal, wood and fiberglass, and come in many colors. Diabolo string by Deos, Henrys and Sundia come in fluorescent colors. Sundia diabolos come in a rage of models, with many axles, like the high-toss and five bearing models. 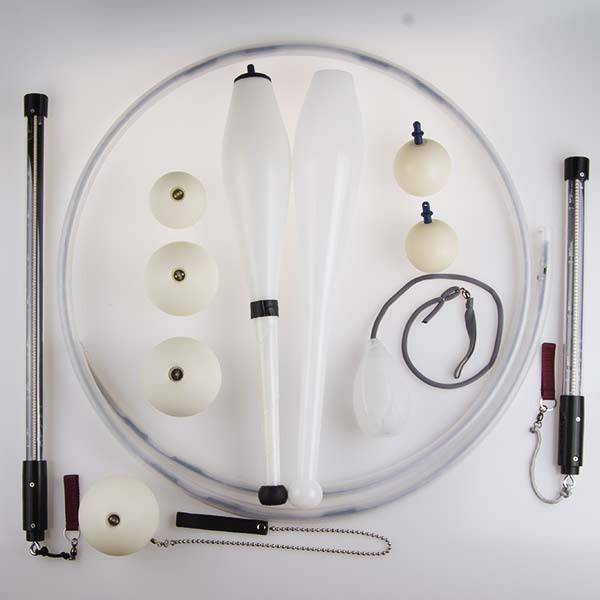 Renegade Juggling offers a full range of LED juggling and flow arts products. Many products that were formerly either fire or manipulation props have been adapted to LED electronic lighting. Many performers need to use LED props when open flame is not allowed. With the rapid advancement of LED lights and electronics, many products are now also fully programable. You can synchronize the lighting effect to your music and use your smart phone or tablet as the remote control. These new systems allow you to import your own photographs or images that are then displayed by the LEDs. LED jugging clubs are made to be controlled by both a remote control or solid-state switch. LED hollow juggling ring have four LED lights in each ring and come in ten colors. LED poi come in several different models with unique effects. LED Pixel Poi, Pixel staff, Pixel Hoop and Pixel Dragon staffs made by Lightix are the most advanced products. LED batteries, charging cables and remote-control units are sold separately or with LED kits. LED diabolo lights for Sundia diabolos can be controlled with an IR remote or analog switch.